The South-East Regional Enterprise Plan builds on the success of the South-East Regional Action Plan for Jobs (2015–2017) to ensure that it remains effective and that it continues to deliver jobs across the South-East region and can be robust to address the challenges we face, including Brexit. The Minister for Business, Enterprise and Innovation Heather Humphreys, TD, was in Waterford on Friday 22nd March to launch a new Regional Enterprise Plan for the South-East to support enterprise growth and job creation through collaborative initiatives. The Minister was joined at the launch by Minister for Training, Skills, Innovation, Research and Development, John Halligan, TD and Minister of State at the Department of Housing, Planning and Local Government with special responsibility for Local Government and Electoral Reform, John Paul Phelan, TD. The South-East Plan identifies five Strategic Objectives, with actions to: enhance the existing environment for enterprise activity and growth, while building greater resilience; establish the South-East as a place of choice for talent and investment; develop a regional engagement strategy to highlight critical infrastructure developments; make the South-East a ‘learning’ region; and the develop the region’s tourism offering. 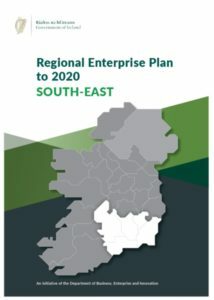 The South-East Plan is the final one of nine Regional Enterprise Plans launched by Minister Humphreys in recent weeks.